What makes an electric charge move? You know that work has to be done to lift an object because the Earth's gravitational field is pulling the object down. In a similar way work must be done to move a charged particle in an electric field. The amount of work required to move a charge between to points or the work per unit of charge is called the 'electric potential difference' between the two points. The unit of potential difference is called the volt. Potential difference can be either positive or negative depending on the movement of the charge. To move charges we need a device that can do work. Such devices include: batteries, generators, thermocouples and batteries. How do electrons move along a wire? Electrons do not move along a wire like cars on a highway. Actually, Any conductor (thing that electricity can go through) is made of atoms. Each atom has electrons in it. If you put new electrons in a conductor, they will join atoms, and each atom will deliver an electron to the next atom. This next atom takes in the electron and sends out another one on the other side. What is electromotive Force (EMF)? Electromotive force, also called emf (and measured in volts) is the voltage developed by any source of electrical energy such as a battery or generator. It is generally defined as the electrical potential for a source in a circuit. A device that supplies electrical energy is called electromotive force or emf. Emfs convert chemical, mechanical, and other forms of energy into electrical energy. The word "force" in this case is not used to mean mechanical force, measured in newtons, but a potential, or energy per unit of charge, measured in volts. 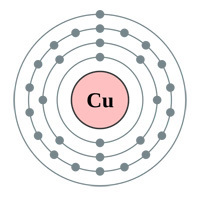 In metals such as copper, silver and aluminum the electrons are not tightly bound to the atoms. They are called "free electrons". This makes them good conductors. Condu tors are materials that allow electricity to flow easily. When a negative charge is brought near one end of a conductor electrons are repelled. When a positive charged object is placed near a conductor electrons are attracted the the object. Metals contain free moving delocalized electrons. When electric voltage is applied, an electric field within the metal triggers the movement of the electrons, making them shift from one end to another end of the conductor. Electrons will move toward the positive side. Copper is a good conductor because the outer most electrons from the nucleus are weekly bound and repulsive, such that a small perturbance, like a potential difference between two ends of a wire, can knock the valence electrons from an atom free, which then perturb the neighboring valence electrons and so on resulting in a cascade disturbance of moving charges or current throughout the material. The energy required to free the valence electrons is called the band gap energy because it is sufficient to move an electron from the valence band or outer electron shell, into the conduction band where upon the electron may move through the material and influence neighboring atoms. The above following diagram illustrates this concept. A battery converts chemical energy into electrical energy by a chemical reaction. Usually the chemicals are kept inside the battery. It is used in a circuit to power other components. A battery produces direct current (DC) electricity (electricity that flows in one direction, and does not switch back and forth as is with (AC) alternating current). For more information on Batteries see: How does a Battery Work? A generator usually means a machine that makes electrical energy. It has a generator head with wires, spinning inside a magnetic field. The resulting electromagnetic induction makes electricity flow through the wires. Hybrid electric vehicles carry a generator powerful enough to make them go. The biggest generators don't go anywhere; they stay in their power station. 1. What makes an electric charge move? 3. What makes something a good conductor? 4. What does a battery primarly do?